Pages 52 and 53 up. Tried to improve the drawing quality a bit... without much success. Sorry. Thanks for the disc space 'gain, Tenshi. I wonder whom Bryan sees in the last comic page Isn't it the kunoichi he wounded? Ding, ten points to Tenshi again for guessing the storyline. Say, ever thought about a career of a fortune teller? Oh, yeah, next two pages are up. Photographed pages, I'll scan 'em on Monday when I get to school. Pages 56 and 57 up. Let me know your honest opinion on the little change I made. I'm gonna have to cut down the amount of my inspiration bewerage (coffee, in other words). I got a nasty gastric ulcer so I'm drinkin' a big bunch of Japanese green tea now. Bryan (holding T1 Yoshi pic): "Geez, is this really you?" Yoshi: "Hadn't found my style yet." That's a nice joke! Yoshi seems not to have found his style at all. Ooh! Ooh! I finally figured out the Snake Eye kanji problem! If I'm not badly mistaken, kanjis "Hebi" (=snake, serpent) and "Me" (=eye) are pronounched as "Jiyanome" when put together. Phew, and I thought Finnish and Swedish are the two most difficult languages on Earth, heh! Have you got any cure to writers' blocks? I've been struggling with the next scene for ages, and I still haven't got any reasonable solution for it. On top of that, my sensei accidentally cracked my left wrist during out last judo lesson, meaning I won't be drawing well for some time. Sure, I can try and do it right-handed, but the quality of pics will suffer! BTW, nice Yoshi spirit drawing! But... I forgot to delete the watermark logo addition... if you re-upload your picture, it will disappear. I'll be more than glad to receive ideas from the Yoshi-guru Tenshimitsu herself! 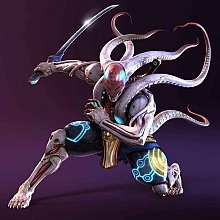 "Spirit Yoshimitsu" is another idea of mine that needs a little developing, but I'm getting it all together as I write. That may not be the final outlook (thus the "1. Version"), but it should be something like that. I'll try to finish the next page ASAP, but since my lefty is still busted, it will not look very good. OK, I PMed you some ideas... hope they will help! Page 68 up and running. I feel I should tell something about the timeline of the Blood Ring. It is a part of a series I am making. Third part, actually. The first part is called "Path of Endurance" that I'm writing at fanfiction.net. It's a story about Bryan's life from his birth to Tekken 5 (so far...). Immediately follows "Rautanyrkki: Ikivihre?n malja" - the fan movie I made. I'm planning to write it down as a story, and go into further detail with it. Then comes the Blood Ring, and it is followed by the grande finale that I haven't even named yet.